Sacramento Raceway Park results - Miata Turbo Forum - Boost cars, acquire cats. Last edited by thumpetto007; 11-14-2015 at 05:36 PM. Nice runs man. I know it's torture being that close to the next second down and not being able to get it, seems like that happens to me every time. Haha, yeah. I figured, i tried three different techniques, and shift points, and the car pretty much did exactly the same thing. It wasn't gunna happen. I also felt launching at 4000rpm was high enough. Probably could have got the 15 if I launched harder. Not bad for basically stock. 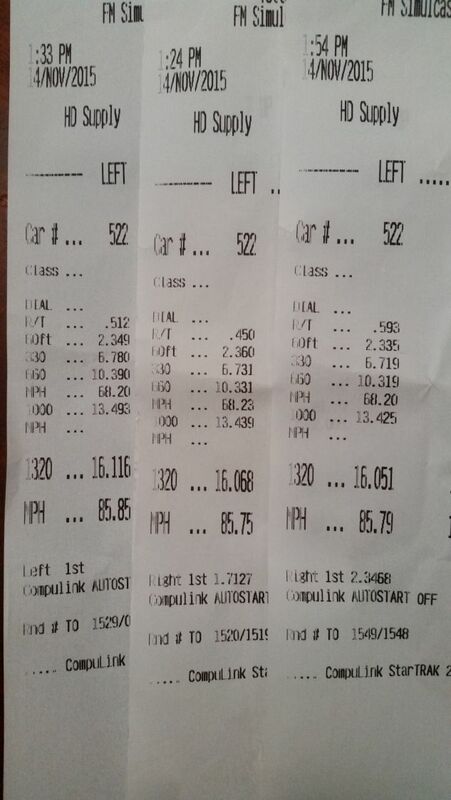 I think I did 15.8 @ 86 stock at same track, I have the slips posted here somewhere. You can definitely improve on that launch. I think I got 2.1-2.2 on all seasons and I'm no pro by any means. 2000 Miata LS w/ older FMII kit - Cheap!